Stories of someone overcoming life’s challenges and demonstrating that the impossible is possible can be inspiring and very meaningful, especially at this time. With that in mind, we are thrilled to pass the Compassion Torch to a Champion of Compassion whose story is particularly relevant to the Compassion Games, the Compassion Torch, and what took place at the U Day Festival in Ethiopia. In 1986 David Gershon, Gail Traub, and their team initiated the First Earth Run and carried the Torch of Peace around the world. It’s seemed like an impossible journey, something unimaginable but then it came to be. The Torch of Peace was lit in Ethiopia in February 2018 with the Compassion Torch, and Lamp of Unity to converge into the Fire Of One Love at U Day Festival. Here is a video of the story of the first ever Earth Run with the Torch of Peace in 1986 that traveled around the world. First Earth Run: A Catalyst for Hope from Gail Straub & David Gershon on Vimeo. David conceived and organized at the height of the cold war, in partnership with the United Nations Children’s Fund and ABC Television, one of the planet’s first global consciousness-raising initiatives—the First Earth Run. As part of this event a torch of peace was passed around the world engaging 25 million people and 45 heads of state in 62 countries. A billion people via the media witnessed it circumnavigating the globe. As part of its journey, the Torch of Peace shed light on acts of cooperation for the common good and raised millions of dollars for children suffering the ravages of war. David Gershon, co-founder and CEO of Empowerment Institute, is one of the world’s foremost authorities on empowerment and large-system transformation. His clients include cities, organizations, government agencies, and social entrepreneurs. He is the author of thirteen books, including the award-winning Social Change 2.0: A Blueprint for Reinventing Our World and co-directs Empowerment Institute’s School for Transformative Social Change which empowers change agents to design and implement transformative social innovations. These challenging times call for a leap forward in how we realize the social changes that we need to make individually and collectively. Fortunately, David wrote the book Social Change 2.0. and recognizes the power of play to create social impact. We have begun to collaborate on the Seven Actions to Create Peace on Earth as a Compassion Game. Each of the Seven Actions can be worked on independently and concurrently, and alone or with a team. We are planning to reinforce and build our collective capacity over a seven-year time frame. In this first year, 2018, our goal is to coalesce a critical mass of “DreamKeepers” who believe it is possible to create Peace on Earth. We will experiment with a new tool to synergize and act together; it is called Unifyre. 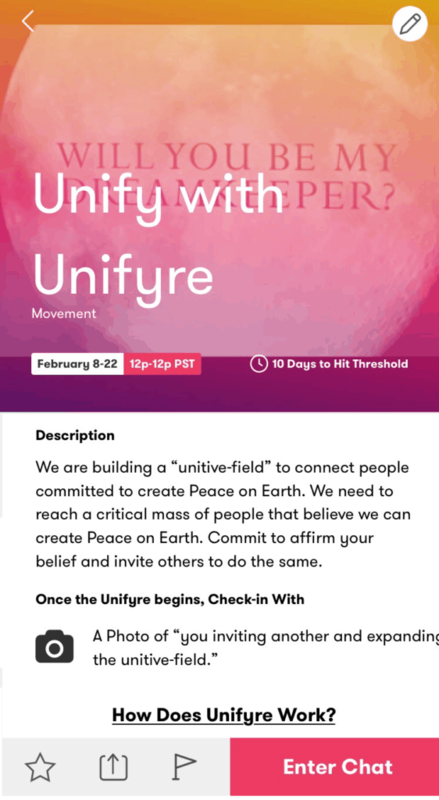 Let’s Unify with Unifyre! Undoubtedly, we will learn a ton in the process. Follow the link and commit to Be a Dreamkeeper and agree to invite others to join with you. When you invite others, let the crowd know that you did this by reporting back to the Unifyre. When you check in with Unifyre about your action commitment, the Compassion Report Map is connected as a featured way to play April Compassion Games. Reports will be due April 30th. Where shall we begin to talk about this starlight warrior of peace and truth? She lives and breaths healing for our Earth. Her song with the magic of her unique voice is like a guiding light out of the darkness. We are delighted to light the Compassion Torch for Kristin Hoffmann. She is a Champion of Compassion pulsing heart-centered inspiration and soul action ripples around the world. Here is a profound example of her embodied spiritual compassion as we passed her the Compassion Torch in Shashamane, Ethiopia at U Day Festival: Land Of Origin 2018. See her fire for this world that is part of an ongoing Compassion Game, Global Fire of Compassion and One Love. Starting at the age of 4, ethereal renaissance songstress and Juilliard trained multi-instrumentalist, Kristin Hoffmann began building a prolific career in music. In addition to stints at major record labels, Capitol and Interscope Records, and song placements on hit TV shows like Dawson’s Creek and Palmetto Pointe, she has shared stages with The Wallflowers, Feist, Brandi Carlile, Richie Havens and many other musical luminaries. With a strong sense of artistic altruism, she is most passionate about projects that explore music’s healing power and allow listeners to tap into their higher potentials. Kristin composed 170 songs for health-challenged children as a writer/producer at non-profit organization Songs of Love. A spokesperson for ocean conservation, she has performed her Song for the Ocean at environmental awareness conventions and concerts around the world, including TEDxSF, Bioneers, Hermanus Whale Festival (South Africa) and with The Royal Philharmonic Orchestra in London. Over the past 2 years, she has continued to expand her worldly voice, guest blogging for many well-respected magazines, from Elephant Journal to The Ecologist, and performing at The Conscious Life Expo (LA), the signing of The Fuji Declaration (Mt. Fuji) and The Emoto Peace Project concert in Tokyo. In 2014, Kristin was invited to become the youngest member on the board of FIONS (Friends of Institute of Noetic Sciences). In early 2016, she was voted onto the board of Gandhi Global Center for Peace and was also a new inductee into the acclaimed group of luminaries of the world called Evolutionary Leaders. 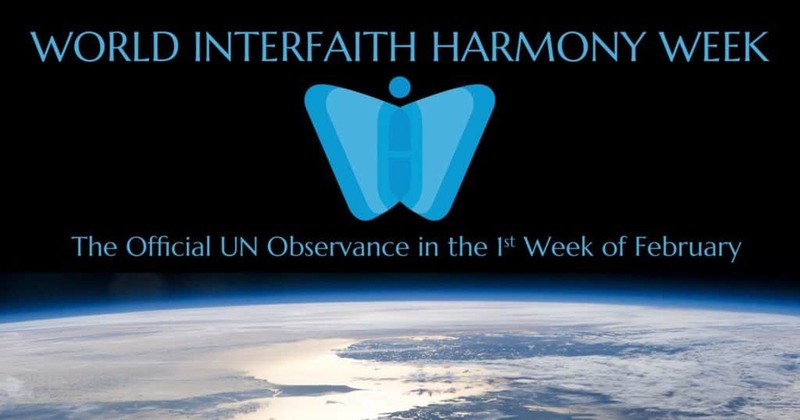 Compassion Games began to build relations with Kristin Hoffmann in February as new members of Unity Earth’s U Day Festival in Ethiopia during World Interfaith Harmony Week. Kristin is instrumental in the creation, planning, and musical magic of the Festival. We had the precious opportunity to converge in the sacred holy land of Lalibela, Ethiopia in a ceremony bringing the Torch of Peace, The Light of Unity, the Compassion Games Global Compassion Torch together to co-create the Fire of One Love. Kristin Hoffmann held the torch of Peace and sang us to new heights of higher love under an unforgettable super full moon. Here is a sneak peak of the power of U Day Festival with Kristin and 65 other diverse delegates from around the world in this brief video made by Unity Earth Team. 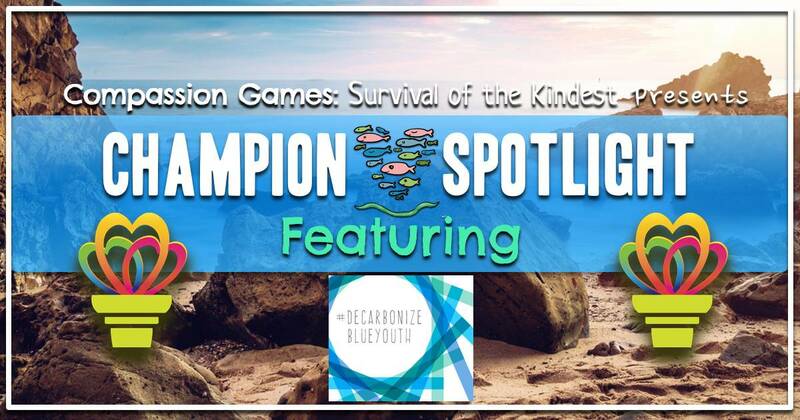 You can access the song’s lyrics in English, French and Japanese on her website here to support singing in your teams, families, community events, schools, homes, and clubs around the world as a featured way to play April Compassion Games. We featured Kristin Hoffmann on our monthly Global Social Media Cafe and she blew our minds and hearts with thousands of people from around the world together honoring World Water Day with her song. See the moment captured here in this video and sing along if you wish. 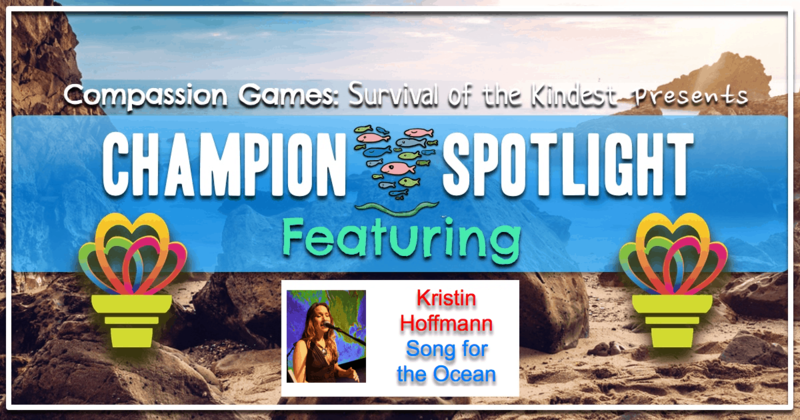 As a way to celebrate Kristin Hoffmann as a featured Champion of Compassion, we invite you to share singing her song around the world on the Compassion Report Map. Thank you for all you do to make a more compassionate world Kristin. We LOVE YOU! We are passing the Compassion Torch to a key leader of Kindness in the world today. Wendi Gilbert is a Champion of Compassion with an incredible active vision unfolding this week called the Kindness Evolution Collective in Half Moon Bay, California. Wendi has been researching the kindness space for the past five years. Based on the wealth of data she’s amassed, in addition to key relationships within a nationwide network, she’s organized, Wendi is positioned to power our nation’s kindness Evolution. She brings 30+ years of experience in the for-profit and non-profit sectors and has the passion for a big vision, grounded in a practical plan for making a massive positive impact in our nation, and ultimately the world. She was recently chosen to be one of ten speakers for the People’s Stage, where she spoke about our national kindness landscape and the mission of this weeks Kindness Evolution Collective. 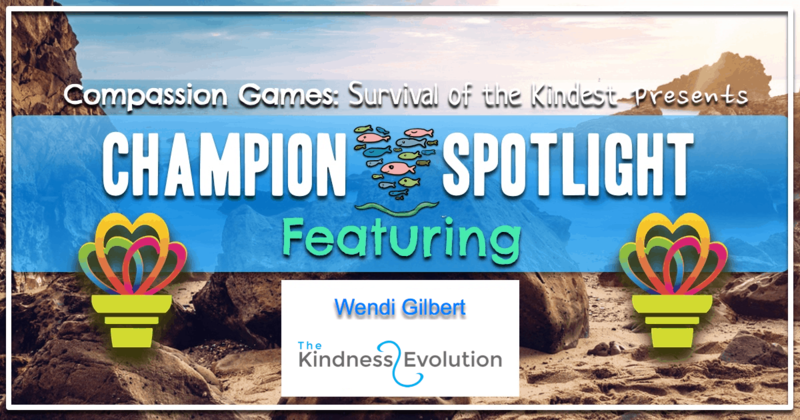 See in this two-minute video Wendi’s amazing inspiration and global vision of this weeks event that our Compassion Games Leadership Team will be attending as part of the Closing Ceremony of April Compassion Games. Connecting with other leaders in the kindness community to collaborate, network and share resources. 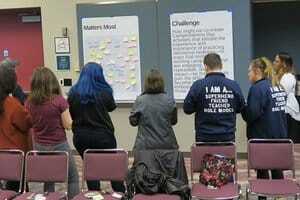 Collaborating with our youth attendees to gain new insights about our future leaders. Acquiring new leadership and problem-solving tools from our outstanding facilitation company and obtain a portfolio of shared ideas. Developing some shared visions for the future; fresh insights and inspiration; meaningful connections. Celebrating the work we do in the world! The Inaugural CampKindness Day in July 2018 is another incredible event and gift to the world of kindness possibility for youth. The Kindness Evolution is collaborating with American Camp Association. The American Camp Association (ACA) is a national community of camp professionals that reaches 11 Million Youth. ACA promotes powerful lessons in community, character-building, skill development, and healthy living and has over 11,000 members (YMCA, Boys Club, Girl Scouts) and over 100K college-age counselors. ACA holds conferences for camp professionals to collaborate for the creation of camp experiences that develop children into independent, happy kids! KindnessEvolution is now collaborating with ACA to create CampKindness Day, a day each summer where camps across the nation will focus on activities and programs for the encouragement of intentional kindness and care. Check out what went on in Atlantic City as we began the development of the activities that will launch on CampKindness Day: July 24th, 2018! As a way to light up gratitude for Wendi Gilbert and her kindness vision for the world lets share experiences of kindness in action around the world April 14th through April 30th on the Compassion Report Map. Stay connected to Wendi Gilbert and KindnessEvolution events below! What an amazing day it is to celebrate the most influential human being on the planet, His Holiness The 14th Dalai Lama. His Holiness the Dalai Lama is the spiritual leader of the Tibetan people. He is committed to promoting basic human values, to fostering inter-religious harmony, advocating for the welfare of the Tibetan people and reviving ancient Indian knowledge. Thousands of prayer flags drape a mountain above the Yambulakhang Palace, Tibet. The five colors of the prayer flags represent the five elements: blue for sky, white for wind, red for fire, green for water, and yellow for earth. Which is the home of Tibetan People who have been displaced and in exile since the 1950’s. Temperatures for Tibet’s high-altitude plateau — referred to as the Roof of the World — are rising about three times faster than the global average, and are 1.3C higher than they were 50 years ago. The Himalayas are also called the Third Pole, referring to the fact that they are covered in snow and ice and are particularly susceptible to climate change, like the North and South poles. 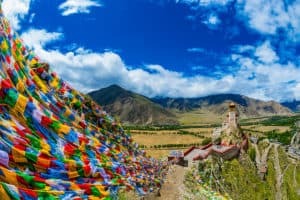 The government-in-exile also argued that Tibetans should be restored as the “true stewards” of the plateau, which has been under Chinese rule for decades and where Tibetans accuse Beijing of mining indiscriminately while forcing nomadic communities to move elsewhere. Up to 70% of the plateau is covered in permafrost, with large reserves of both carbon dioxide and methane trapped within the ice. Scientists say thawing could release long-stored emissions of both greenhouse gases. Methane can be 30 times more potent than carbon dioxide at trapping Earth’s heat. See and listen to His Holiness the Dalai Lama’s full message from COP 21 in Paris, France about environmental solutions. We have just gotten back from a private audience with HHDL on April 6th where we had the great honor and privilege to be with a major inspiration and catalyst to why Compassion Games exists. 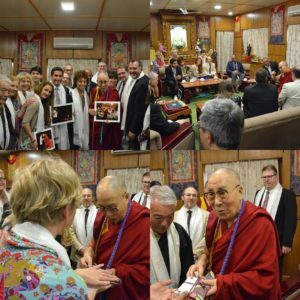 Jon Ramer & Sommer Joy, Compassion Games Founder, and Creative Fundraiser Director were personally asked to be part of a 12 person delegation to invite His Holiness back to Seattle, Washington in 2019. We miraculously fundraised to go to India in a week and were off to India to be with The Dalia Lama. Here are some of the incredible moments with him. April 6th, 2018 is an unforgettable day for Compassion Games international, sharing the fruits of compassion in action in the world with His Holiness The Dalai Lama. Stay in touch with the wisdom and ongoing teaching of compassion for our world with this Champion Of Compassion in all the places below. 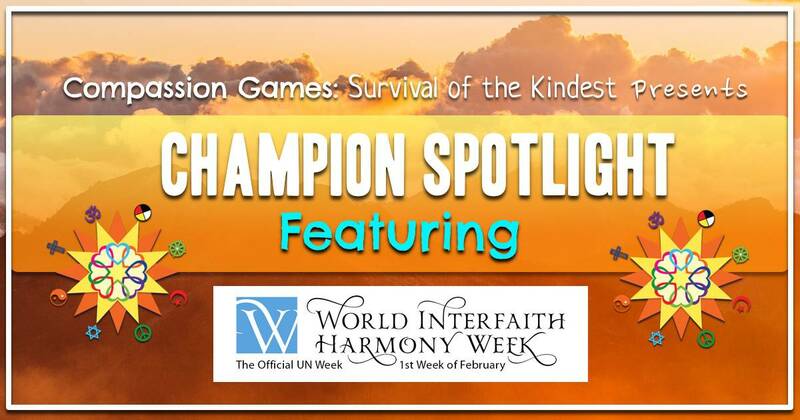 Compassion Games is thrilled to bring light to an extraordinary global leader of truth and compassion in action. We celebrate and pass the Compassion Torch to Norie Huddle, a profound challenger on the planet who has pioneered for five decades how we can care for our Earth better. 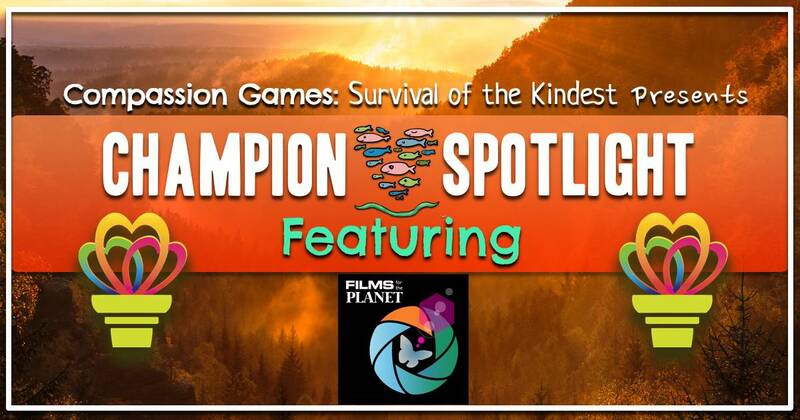 Norie has recently contributed the newest Featured Way To Play Compassion Games through The Best Game On Earth. She recently spoke about her ideas and work for transforming human civilization in a TEDx Talk that will be available on YouTube for the world to see after April 27th. We are so excited to also have her on our Compassion Games Leadership Team. 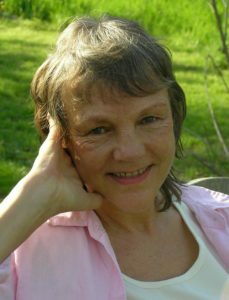 Norie has written seven books on environmental issues and on transforming humanity that have been published and translated into several major languages. Four of her books have been bestsellers (one a NYTimes bestseller). A fifth book, Butterfly, is the “First Special Project in The Best Game On Earth,” and has become a popular global meme that describes humanity’s ongoing transformation process. Her most recent book, Return To The Garden, lays out many of her ideas in the form of a novel and is available on Amazon Kindle. Much of Norie’s work is focused on helping people create a peaceful, healthy global civilization. She has been a professional interviewer and public speaker in several languages for almost five decades. She does coaching and mentoring, workshop design and facilitation, and consulting with governments, cooperations, and NGO’s. Norie has an eclectic, international background. She was an American Field Service Exchange Student in Italy for a year, majored in Russian language at Brown University, spent two years in Colombia, South America, as a Peace Corps Volunteer, and lived in Japan for four years where she worked with Japanese colleagues to address their environmental crisis where she worked on environmental issues, interviewed hundreds of Japanese experts and citizens for her first book, Island of Dreams: Environmental Crisis in Japan, that analyzed the crisis using a holistic systems methodology she learned in the Peace Corps. Returning to the US in 1975, Norie organized Project America 1976, involving a dozen Americans and Japanese who bicycled 5,000 miles in a zigzag route across the US. During the trip, she interviewed Americans about their hopes, fears, and visions for the future and wrote Travels With Hope, a book that became a bestseller in Japan. Norie was the first person hired by Mobilization for Survival to launch the American antinuclear movement in the US (1977-78). That experience helped her see the limits of “anti” movements and the urgent need for a new kind of “positive, vision-oriented movement.” To facilitate this, in 1979, Norie founded the Center for New National Security (CNNS), to look for new directions in national and global security, broadly defined. In 1980 she launched what is now a 38-year experiment in electronic democracy that she calls “The Best Game on Earth,” which she has introduced on four continents with great success. 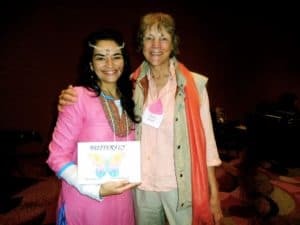 Norie’s 1990 book, Butterfly, has given birth to a global meme of transformation now used widely by people like Deepak Chopra, Barbara Marx Hubbard and many other spiritual leaders around the world. Under the aegis of CNNS, Norie spent four years interviewing over 400 people about national security issues and wrote her NY Times bestseller, Surviving: The Best Game on Earth. She also participated in numerous citizen diplomacy trips to the USSR during the 1980s, including two US-USSR Citizen Summit Conferences where she introduced “The Best Game on Earth” in 1988. She played a pivotal role in introducing Xerox machines into the USSR in 1989. Norie speaks fluent Spanish and Japanese, good Italian and Russian, some German, French and a little Chinese. She has built a powerful network of influential colleagues around the world and serves on the General Assembly of the Union of International Associations (UIA), a prestigious Brussels-based organization with global database of over 67,000 NGOs, some with millions of members, all working to strengthen civil society in every sector. Since 2007, Huddle and her husband, Richard Wheeler, have been living part-time in Ecuador, where they are building the Garden of Paradise, an innovative model of rural development on 350 acres, that is the “Second Special Project in The Best Game on Earth.” To date, this includes a healing and retreat center and sustainable organic agriculture and other initiatives. In 2011, Norie and Richard won the world’s first lawsuit defending the Rights of Nature, a breakthrough legal right guaranteed by Ecuador’s 2008 Constitution that legal scholars consider to be on a par with ending slavery as a legitimate institution and giving suffrage to minorities and women. 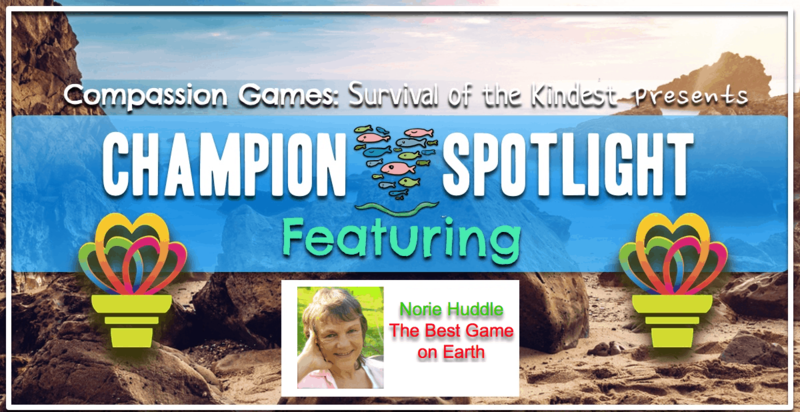 As a way to celebrate all Norie Huddle has done building compassion and leading solutions to transform humanity into a butterfly with Mother Earth, we invite you to join Norie in the 2018 April Compassion Games by participating in this new featured way to play called, The Best Game On Earth. 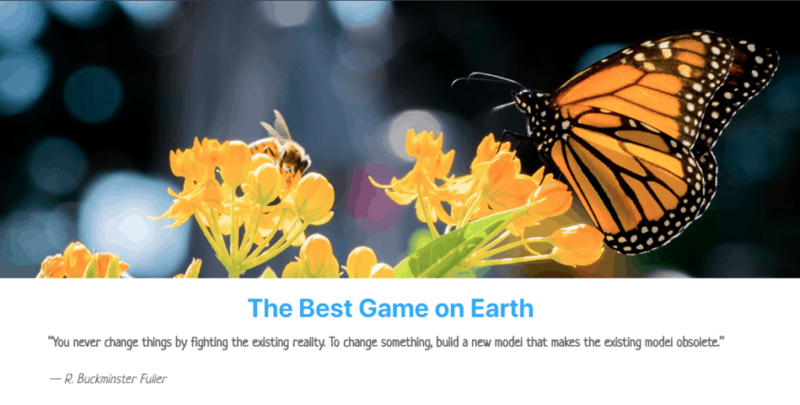 As a new featured way to play in the 2018 April Compassion Games, we invite you to play The Best Game on Earth, which aims to provide a simple but powerful framework for transforming humanity into a compassionate, caring civilization – what Norie calls a “global butterfly civilization” – that lives in harmony with Mother Earth. Here is a sneak peek into the basics of how to play The Best Game on Earth. following 10 simple rules or guidelines for play. To get started, read the Goal and imagine how amazing life on Earth will be when we’ve achieved it by 2030. THE GOAL: Peace, health, prosperity, and justice universally on Earth by the Year 2030. Acknowledge the truth when others speak it. Come from love, respect, and gratitude. Do what gives you joy and create joy in what you do. Be generous with who you are and what you have. Be a good friend and teammate. Clean up your messes, learn the lessons and move on. If you have an idea for how to improve The Game, share it. 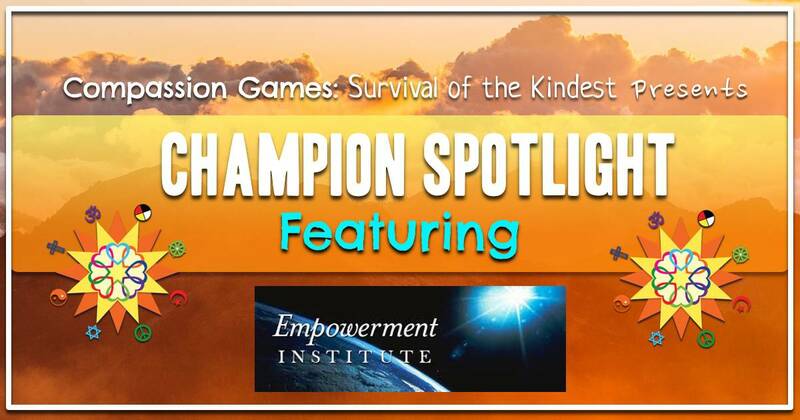 For more details about this new ongoing Featured Way To Play the Compassion Games, check out the landing page of The Best Game On Earth that goes into more details. Share your experiences and reflections until April 30th with teams and individuals around the world on the Compassion Report Map. Let us rise together and share our deep bows of gratitude for the historical difference Decarbonize Blue Youth, as the world’s largest youth lead synthesis of climate action and recommendation. 11,000 Students were engaged in contributing 25,000 hours to the creation of a global White Paper on Climate Change from September to November 2016. This process was completed with a Writers Retreat in Marrakech, Morocco during the UNFCCC COP22. Here is the 2018 theme #Decarbonize #Decolonize for Blue Youth around the world with big plans leading up to COP24. You can join thousands of youth from across the planet. See all the places youth are becoming leaders through these Champions of Compassion on the map below! See this group of youth from at Marrakech, Morocco during the UNFCCC COP22 do an amazing job speaking about indigenous water access!! Aboriginal voices need to be heard! These #Decarbonize Youth leaders share incredible wisdom about climate change and Earth Compassion action to take. See how these incredible champions of compassion made a huge difference in the Compassion Relay with the Global Compassion Torch being in their hands leading up to in November 2016 with Hereditary Chief Phil Lane Jr. and The Green Sheikh. You can take action today with Decarbonize Blue Youth by entering in your Climate Change art to be part of United Nations COP24. See all 224 submissions and add yours as well HERE! Share your action as part of April Compassion Games on the Compassion Report Map! Continue to celebrate this amazing group of youth from all over the world by following the latest action below! The Green World Campaign works to reforest our planet, raise the living standards of the rural poor, and combat global climate change. Green World is planting trees to regenerate the soil. he GWC has bold agenda: Catalyze a global movement to reforest our planet, raise the living standards of the rural poor, and combat climate change. 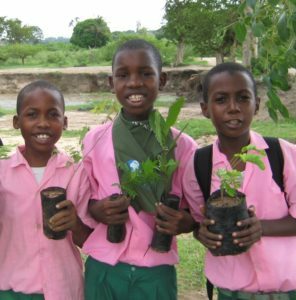 Its far-reaching aim—to plant hundreds of millions of trees while lifting millions of people out of poverty—can only be achieved by all of us working together. 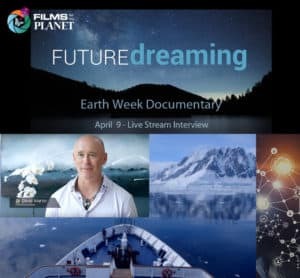 See Founder of the Green World Campaign and Author of Compassionate Life, Marc Barasch shines a light on solutions for Climate Change from the most recent Parliament of Worlds Religion. They link environmental activities in the developed world and support green self-sufficiency in developing countries. Green World Campaign invites companies and organizations to affiliate with the GWC, to shrink their carbon footprint while restoring the ecology and economy of the world’s poorest places. They also form alliances with schools, churches, corporations, and other institutions to develop “sister villages” that encourage communication that village’s children. Help people plant their future–and ours. Join this Champion of Compassion in May at this Regenerative Revolution May 1 – May 4th. This May 1-4, in San Francisco’s fabled Mission District, Green World Campaign will join in the first-ever ReGen conference–a gathering to foster a new regenerative culture for the mutual thriving of people and planet. This action-focused event will convene leading-edge players in a growing movement “beyond sustainability.” Hundreds of diverse participants from philanthropy, business, government and citizen activism will come together to establish a network–and a society–that serves all of Life. We will learn how to create regenerative system change in food and agriculture, innovative finance, urban design, and much more. We’ll discover powerful tools, concepts, and connections to help transform our organizations, our communities, and our world. Other event partners include Leonardo DiCaprio Foundation, Buckminster Fuller Institute, Dr. Bronner’s, Social Venture Network, Green America, Kiss the Ground, The Carbon Underground, and many others working toward a positive future and a world that works for all. Celebrate Green World Campaign with us today by taking action to help plant trees HERE and share your participation on the Compassion Report Map playing April Compassion Games with teams around the world together. See all the great places to stay informed about Green World Campaign below! As the world looks to find a new way to balance, preserve and protect Mother Earth we are grateful to have a partnership with the Earth Day Network and to recognize them as the lead “Champion of Compassion” to kick off 2018 April Compassion Games. We pass the Compassion Torch to Earth Day Network today. We are thrilled to bring attention from hearts around the world to this year’s theme to “End Plastic Pollution.” From poisoning and injuring marine life by disrupting human hormones, from littering our beaches and landscapes to clogging our waste streams and landfills, the exponential growth of plastics is now threatening the survival of our planet. The Earth Day Network is an incredible resource and sacred place for solutions to bring into our communities. inspiration needed to fundamentally change human attitude and behavior about plastics. Earth Day Network’s mission is to diversify, educate and activate the environmental movement worldwide. Growing out of the first Earth Day, Earth Day Network is the world’s largest recruiter to the environmental movement, working with more than 50,000 partners in nearly 195 countries to build environmental democracy. More than 1 billion people now participate in Earth Day activities each year, making it the largest civic observance in the world. We work through a combination of education, public policy, and consumer campaigns. As of 2018, Earth Day Network has reached 2,688,209,868 Acts of Green. Help them and the precious Earth to reach 3 billion! Plastic Solutions is one of the main focus campaigns this year. Currently, about 300 million tons of plastic are produced each year to make bags, bottles, packages, and other commodities for people all over the world. Unfortunately, only about ten percent of this plastic is properly recycled and reused. The rest ends up as waste in landfills or as litter in our natural environment, where it leaches dangerous chemicals into the nearby soil and water, endangering humans and wildlife alike. See what actions you can start today HERE with this year’s Tool Kit! 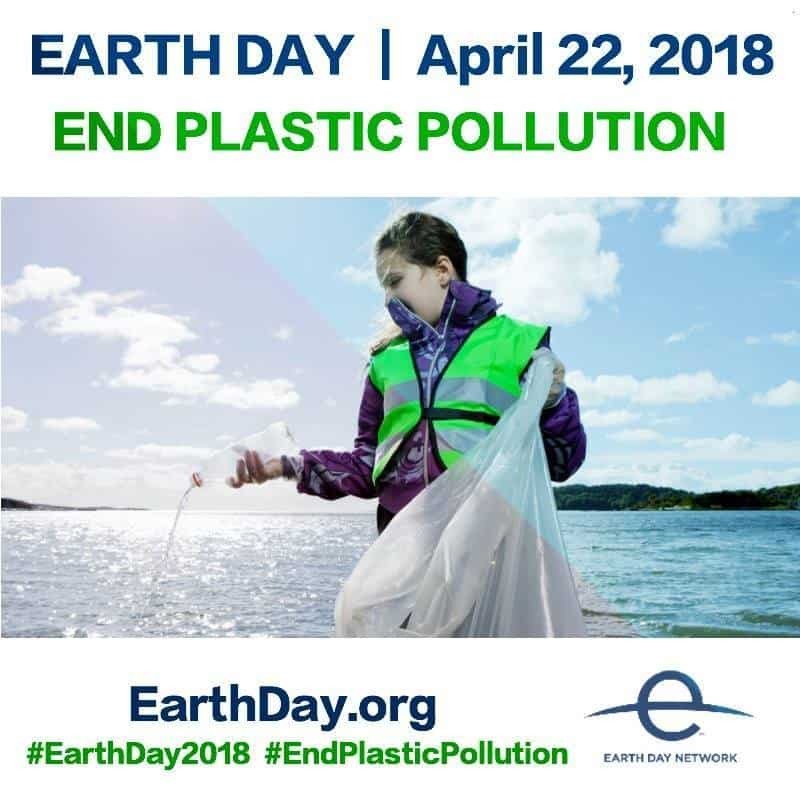 Let’s take personal responsibility together with plastic along with Earth Day Network through playing April Compassion Games and share participation on the Compassion Report Map April 14th through April 22nd. All reports are due on April 30th. Check out Professional Athlete and Inspirational Speaker Amy Purdy here as Earth Day Network’s featured Athlete for the Earth in this video below. See all the ways to engage with Earth Day Network the world’s largest environmental movement below.